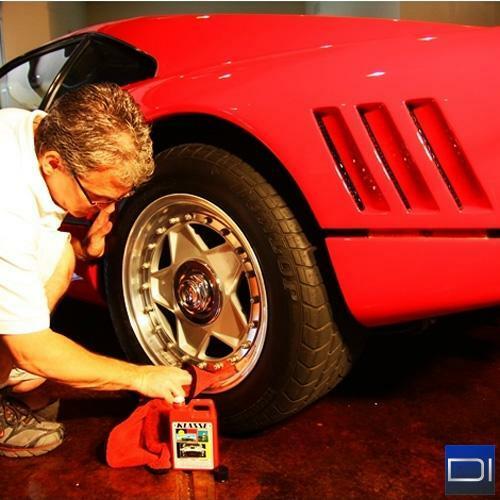 This is one of the premier one step products in the detailing industry for its amazing ability to polish and protect in one easy application. Klasse All In One is a non-abrasive polish that will remove oxidation, old wax, bug smear, and some fine swirls, scratches and tar. This step will really brighten the paint and really make it "pop" again. While it cleans the paint's surface it also leaves valuable protection from its specially formulated acrylic coating. 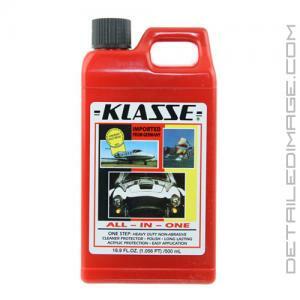 Klasse All In One is a sealant that is extremely durable and will protect your paint for months to come. It will protect far longer than natural waxes against fading from the sun, moisture, oxidation, salt water, pollution, bug smear, and other build ups. It applies extremely easy and thin so you get a great value from just one bottle. You can also protect metal surfaces, door jambs, coated plastics and more. Give your painted surfaces and more everything they need in one simple step! Apply KLASSE on paints, plexiglass, fiberglass, glass, plastics, enamel, metal surfaces, tiles, formica and other nonporous surfaces. With an easy ONE STEP application, it removes oxidized paint, old was build-up, road tar, surface scratches, swirl marks, gasoline and insect stains. It polishes to "WET-LOOK" shine and locks into the paint, seals and protects with an elastic non-chip, shrink-proof, heat and scratch resistant acrylic finish. Provides 6-8 months protection against salt water, sun, industrial pollutants and corrosive elements. DIRECTION FOR USE: SHAKE BEFORE USE. Apply small amount of KLASSE on clean and dry surface with DAMP cotton cloth. Use even, firm pressure. Wipe off. No drying time necessary. If surface is oxidized, apply till most of oxidation is removed and smooth, glossy, finish appears. See "USER'S GUIDE". Satisfaction Guaranteed. This AIO is amazing. It removes oxidation with the greatest of ease. I also love using this product on plastic and rubber trim. I used it on the black window trim of a Honda Civic and it looked like new. I always have a bottle in my arsenal. This stuff saves me so much time. I would definitely by this product again. Awesome product, never disappointed with the results. Easy on and easy off. I've been using the Klasse AIO product for 10 years and will continue to for as long as it's available. Thanks so much. Amazing service as usual.